In Pixar’s animated Dia de Los Muertos fantasy Coco, the song “Remember Me” is played twice, on two opposing ends of the emotional spectrum. One version is big and uptempo, inspired by mariachi music and ranchero songs. The other is sad and plaintive, a lullaby intended to tug at your heartstrings in the metaphysical movie’s wrenching finale. 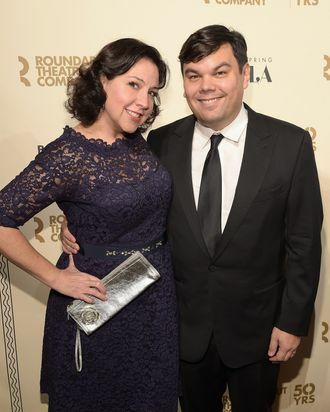 Unlike many nominees, the writers of the song — Oscar-winning husband and wife songwriting duo Robert Lopez and Kristen Anderson-Lopez — didn’t learn of their nomination for “Remember Me” through some third party, from texts from friends, or even an excited publicist phone call. As East Coasters, they were sitting on their sofa in Brooklyn watching the nomination livestream with their daughter when they heard their own names called. The Oscar season do-si-do isn’t exactly a new thing for the Lopezes, who claimed an Academy Award in 2014 for their songwriting on the Disney blockbuster Frozen — specifically, Best Original Song for the inescapable anthem “Let It Go” — and Robert holds the additional distinction of being the youngest EGOT winner in history. But to hear them tell it, “Remember Me” holds deep personal resonance, a song they sang together as a family to mourn the death of a loved one last year. Where were you when you discovered been nominated? Kristen Anderson-Lopez: We were able to watch it with our 8-year-old on the couch. Our seventh-grader wanted to stay home and watch too, because they both really wanted us to get nominated because they know they’re going as our dates. So they both had a real agenda! Robert Lopez: They’ve never been so supportive before. You’ve been through all this before with Frozen. What is it like to go through the process of being nominated for an Oscar again? Is the impact any different this time around? ﻿KAL: This year, we happened to know more of the people who had beautiful songs. This year is very competitive. We feel really, really lucky to have gotten in. It could go any way. There are two different versions of this song in the film. Two different emotional impacts. That kind of increases your odds in the nominations department, wouldn’t you say? RL: That’s what we love about it. [Laughs.] We love that it performs several different functions within the movie. That was the trick to writing it. It’s also become this personal song for our family. We experienced loss this year. My mother died. We sang it at her funeral. It was a way to get us through a really tough time. KAL: We got a beautiful text from Bobby’s dad. Bobby’s mom was his champion, some might even say stage mother. His dad wrote, “Your mom is dancing up in the clouds today.” She died of cancer and she knew we were going to sing this at her funeral. And so this song is really hers. What kind of research on Dia de Los Meurtos did you do prior to writing it? RL: Pixar had done a lot of the research for us and shared it with us. We took trips and saw the festival firsthand, then took a real deep dive into Mexican music through the help of Mexican consultants Pixar had hired and learned about all the different types of Mexican music — of which there are many. KAL: Mexican music is so much more than just mariachi. There are so many incredible genres. A Mexican artist named Camilo Lara — he’s known as the Mexican Institute of Sound — we became friends with him and he spent a weekend with us in Brooklyn and introduced us to the history and many, many branches. This project has been a gift to us. It’s given us this holiday that we now can use to mourn those we have lost in a really celebratory, productive way. Rather than feeling sad, we have an ofrenda. And we have a new world of music that we love as a family. At a cultural moment when our president is talking about building a wall, Coco seems to have struck a chord. I wonder if you had any thoughts about how your song fits into this moment? RL: The movie is about a bridge. The bridge to who you are and who your family is. Music is a bridge to other cultures — a language that we all can understand. This movie is about a beautiful marigold bridge. Not a wall of division.